Settled in 1623, the city claims the third-oldest position in the country. Portsmouth clings to its rich history, investing in periodic face-lift projects to maintain its beauty. The Forbes Traveler placed it on its prettiest towns in America list in 2009. Its cultural richness is evident in its many art galleries, sidewalk cafes, jazz clubs, and boutiques. 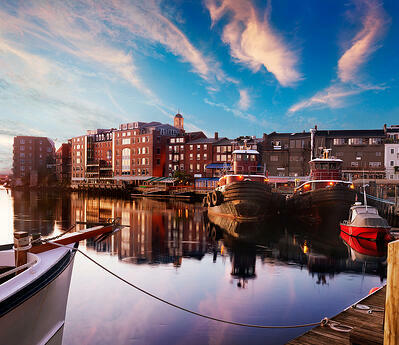 Portsmouth, NH real estate brings much more than just a beautiful home. Portsmouth is approximately one hour north of Boston, one hour east of Manchester and one hour south of Portland. Airports serving the area include Logan International Airport, Manchester Airport and Portland International Jetport. Additionally, private service is available at Pease International in Portsmouth. Interstate-95 (I-95) leads to Portsmouth from points north and south. Multiple shuttle and limousine services, including Seacoast Airport Service, Mermaid Transportation, and Flight Line Inc., provide transportation to and from the airports. C & J Bus Lines link Portsmouth to Boston and New York with 30 motor coaches operating daily, with reduced schedules on weekends and major holidays. Local bus service is available from COAST, the Cooperative Alliance for Seacoast Transportation, which serves 17 neighboring communities. The Amtrak Downeaster provides round trip train transportation from Dover, Durham, Exeter, Portland, Maine, and Boston. The COAST system connects to the Exeter and Dover stations, making it easy to get from a home in Portsmouth, NH to a business meeting in Boston. Portsmouth Public Schools serve over 2,600 students in three elementary schools, a middle school and a high school as well as a pre-school program. Extracurricular activities and an extended summer learning program enhance the educational experience of Portsmouth students. After-school programs in athletics, music, and performing acts enrich their educational opportunities as well. Portsmouth, NH home buyers with children will find that the city’s school system provides a variety of options. The mission statement of the Portsmouth Public Schools reads, "The purpose of the Portsmouth schools is to educate all students by challenging them to become thinking, responsible, contributing citizens who continue to learn throughout their lives." There also are private schools in Portsmouth for pre-school education, as well as The Birchtree Center, a school for children and youth with Autism. There also is St. Patrick's School, a Catholic school located at 125 Austin Street. The University of New Hampshire is located just ten miles away in Durham. Major programs include liberal arts, life sciences and agriculture, engineering and physical sciences, health and human services, and business and economics. The campus also offers a number of two-year associate degree programs such as culinary arts, business management and applied animal sciences. Several other colleges have satellite campuses in Portsmouth. The hub of Portsmouth’s shopping scene, Market Street is filled with restaurants, boutiques and specialty shops that provide almost endless opportunities to find unique items. From wonderful wines at Ceres Street Wine Merchants to challenging pastimes at Diversions Puzzles and Games and G.Willikers Toy Shop, Portsmouth has a diverse and eclectic shopping scene. J.L. Coombs offers a wide selection of fashion and footwear, or for the DIY types, you can make your own from your choice of fabrics at Portsmouth Fabric Company. Among other local merchants in Portsmouth are Prelude, RiverRun Bookstore on Fleet Street and Serendipity. New England is the best destination for top-of-the-line seafood, and the restaurants in Portsmouth are the cream of the crop. The Dolphin Striker and Black Trumpet bistro, which serves traditional French fare, are perfect for elegant meals while the Blue Mermaid offers a Caribbean twist that is perfect for lunch. When cravings for more ethnic cuisines hit, Portsmouth doesn’t disappoint. Cafe Mediterraneo Ristorante offers authentic Italian dishes, while Cafe Nostimo serves up classic Greek dishes. For a great cup of coffee and delectable pastries and desserts, Popovers on the Square is the place to stop. The list of restaurants goes on and on. In Portsmouth, you’ll never run out of things to do for fun and entertainment. If golf is your game, there are about 16 different courses to challenge you in the immediate vicinity. In addition to the many country clubs, Pease Golf Course is one of the finest public courses in New England. As you might expect for an historical district, the area boasts a large number of museums. The Strawberry Banke Museum offers the opportunity to try it yourself with weaving looms in the Cotton Tenant House, the Discover Center, Wheelwright House and the Victorian Children's Garden. Sail on a reproduction of a gundalow barge and see the Piscataqua River as our ancestors may have seen it at the Gundalow Company. Watch the whales and fish the seas on an Atlantic Whale Watch excursion. Additionally, there are wonderful special events like the Prescott Parks Arts Festival every year since 1974. 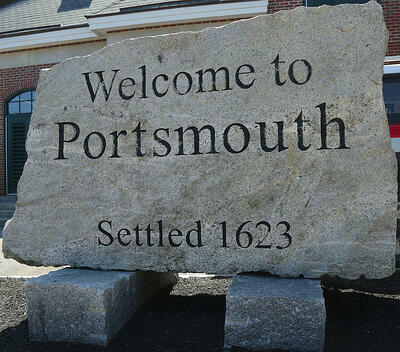 Over the 12 months ending July 7, 2014, there were 336 residential homes sold in Portsmouth. Five of those homes sold for more than $1 million while the median sale price for all residential homes was $336,000. The median price for three-bedroom homes was $370,000. Homes sold on average for 97 percent of the listing price during the 12-month period. Whether you are considering making New England your new home, or are just moving across town, Portsmouth, NH is filled with the beauty and opportunity to make you a satisfied and happy home buyer.